Not only does Alice love to TAKE stoller rides, but she likes to give them too. When Alice was just learning to walk,the stroller was too light, and she needed to have something more substantial to lean her weight on. 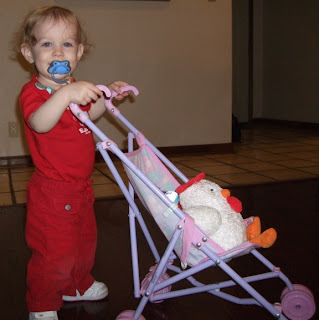 But now that Alice has better balance control she can push around the mini doll stroller. 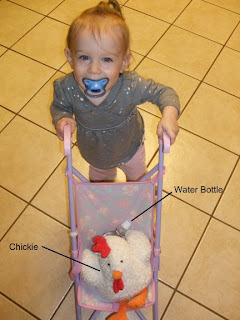 The stroller occupant is "Chickie" - who sometimes gets thrown out, or has to share the stroller with other items Alice piles in....water bottles, pacies, sippy cups, other toys, but she reigns as the strollers' permanent resident.